In addition to the GeekyLibrary Crew reading all of the 2014 nominees for the Hugo Award for Best Novel, I personally wanted to read some of the retro-hugos as well. Retro-Hugos are given out at WorldCons held 50, 75, or 100 years after a WorldCon in which no hugo award was presented. The Retrospective Hugos were added in the 90s, but only awarded 3 times. The winners of the 1939 Retro-Hugos will be announced on the first day of LonCon (the 2014 host of WorldCon). The ceremony starts at 8pm BST on Thursday, August 14th and will be streamed live online. Carson of Venus: An adventure book, a romp, and good fun, but I’m not sure if I felt it had enough substance on its own to compete for an award. It was also obviously serialized. The Sword in the Stone: I wish I had had the chance to read this when I was a kid. I thought I had, but apparently not. Its whimsical story lines and celebration of imagination and play reminds me more of Peter Pan and Wendy than of any other books about the Merlin/King Arthur Legend. Talk a walk, end up on a distant planet, befriend the aliens. Out of the Silent Planet:For a book about landing on an alien planet, there is an awful lot of philosophical moments. I dropped from 5 stars to 4 stars just because of the blatant moralizing. 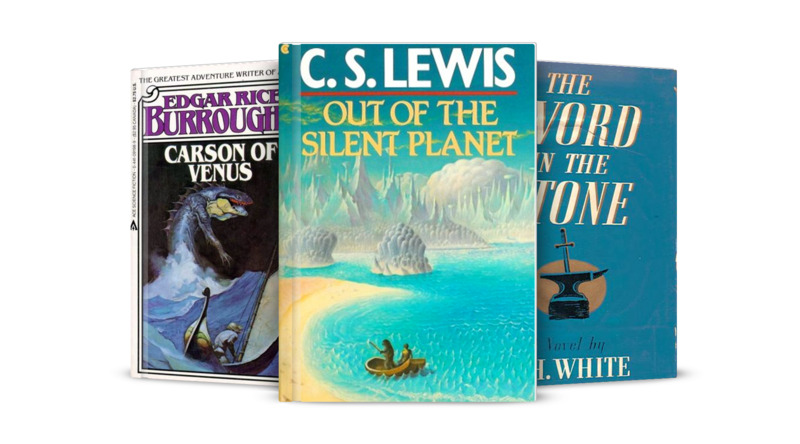 And yet, I think that out of the three books I read, I would award Out of the Silent Planet the 1939 retro-hugo, although it is a close race with The Sword in the Stone. I didn’t get a chance to read either Galactic Patrol by E.E Smith or Legion of Time by Jack Williamson, other nominees for Retro-Hugo for Best Novel. I’m excited to hear about the winners, however! As I mentioned before when the nominees were announced, I was intrigued by the nomination of Ray Palmer for Best Editor (retro-hugo), having recently read a biography of him, The Man from Mars. And I still want to read that 1939 best novelette nominee, Pigeons from Hell. Sci-fi pioneer, UFO crazed, conspiracy theorist, and—if you believed him—a Martian.